Business strategy expert Michele Scism is on a personal mission to help small businesses avoid common pitfalls including poor planning and lack of an effective online presence. If I can share my knowledge with other business owners and help them to succeed I will have fulfilled my passion! The Take Action Get Profits Live conference, October 4-6 in New Orleans, aims to teach entrepreneurs the two critical skills they need to survive past the 5 year mark where most businesses fail. According to StartUp Nation, most businesses fail because of poor planning, lack of an effective online presence, and lack of a coherent sales strategy. “Besides my family. I have one passion in life and that is to help other entrepreneurs achieve the success in business that they deserve! The number of businesses that fail every year is staggering and if I can share my knowledge with other business owners and help them to succeed I will have fulfilled my passion!" 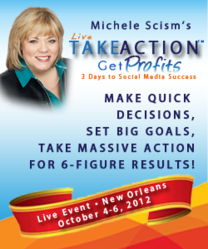 says Michele Scism, founder of Decisive Minds and organizer of the Take Action Get Profits conference. Over the course of three days, the conference takes current and aspiring entrepreneurs through the 7 step process Michele Scism used to create a successful six figure consulting business. Ms. Scism will cover business planning, creating an effective online marketing system (including websites and social media strategies), effective follow up systems and more. Ms. Scism will cover emerging trends in social media including how to leverage Pinterest, Facebook, Twitter and Linked in to build relationships with customers that lead to more sales and profits. Ms. Scism will be joined by Caterina Rando who will teach participants how to use public speaking to build their expertise and relationships with clients and by Tonya Hoffmann who will cover some of the social media topics. To learn more about the Take Action Get Profits conference, go to http://takeactiongetprofits.com.